I prefer updating to ESR24 first and leper favoured that approach too. Any other opinions? Another option is to stay with 1.8.5 Has the rationale for upgrading changed since this post: http://www.wildfiregames.com/forum/index.php?showtopic=17289&p=269566 ? At least it seems we can rule out performance improvement generally, not sure about GC improvements or AI threading. Is random map generation still faster? In my opinion it's completely unacceptable to have such a big part of the game as the scripting engine frozen and tied to one specific version. Especially now that we are so much closer to the upgrade (my WIP patch is now only about 4000 lines long, compared to more than 24 000 lines a few months ago), stopping the upgrade would be complete nonsense. I think AI threading would work without the upgrade. GC could be improved in the future but we will only really know that when/if it happens. I just found this link. There's a short descriptions of what GGC (Generational Garbage Collection) should improve. when v31 will be used, comparison will be done against a version as fast as v1.8.5, if using v24 now and upgrading later to v31 it will be faster than v24, but it will be difficult to say if it's faster than v1.8.5. it adds more code to svn, there are some other things that could be removed anyway, e.g. bundled enet. Anyway the long term will be v31 with the option of using the system lib. In the meantime... thanks for all the months of work done so far! I agree with Yves that the GC improvement in the future seem far from trivial to me. GC is slow in 0 A.D. and leads to a bunch of other issues, so that would be very nice, and if only for that, the upgrade is worthwhile. You have some good points. I plan to work on an integration branch after V24 is committed and update this branch to the current development version. The following issues remain, but I think that's acceptable. We have seen in the profiling above that most of the performance issues are fixed with newer versions. Is it a lot work to maintain it any longer? Then I'm for the upgrade. If it makes the next upgrade easier and the next upgrade is planned, then put it in (upgrade) if you like. If you think, we should throw it all away because an upgrade has no benefit so we'd better stick with the old version and you are not angry, then I'm for that. But imagine what will happen, once the 31/32 Version has real performance improvements. Then everyone will ask you again for hammering out another upgrade .. so I don't know what is best. I think that all depends on how well the "frozen" version works, and relative to how well the upgrade works. We could very well encounter new, worse bugs than we currently have to deal with. That's a risk with any library but most of the others we use are far more stable and don't have major rewrites of the internal workings and API from one version to the next, and they're more general purpose instead of having just one major "user" in mind. We've been testing 1.8.5 for years, but what are the serious issues we need to patch to resolve? There is the weird JIT OOS issue recently discovered, but we have a workaround; I'm sure the upgrade will introduce similar weird JIT OOS issues that take years to discover/work around. That's a sunk cost and shouldn't have any impact on the decision moving forward, on deciding whether it's the best option or not. Doing nothing more should always be an option under consideration. GC could be improved in the future but we will only really know that when/if it happens. I feel like this is getting metaphysical and the arguments could be said of anything old and new with very little rephrase. Regarding the JIT issue, we mostly discovered that it was a JIT issue, so it would likely be much easier to debug such issues this time (others of new kinds could, it is true, arise). What we have already discovered is that the new Spidermonkey is stricter about lax syntax and things like that, which are sources of weird, unpredictable, and hard to debug issues. We also know that it supports multi-threading to a greater extent. And regarding performance, there are several stuffs beyond just compilation magic that could help us, such as new objects (Maps and Sets) which possibly could speed the AI a lot. On 1.8.5, I do not believe the AI will ever be efficient enough. GC is quite likely to get faster, particularly if it can be fragmented (which ought to be able with the newer spidermonkeys). If anything, this should be a separate branch on Git. Somewhere you can just try it easily at some point, to see how some changes react. If we're going to get economic, the opportunity cost of not trying the upgrade is just too high. Being closer to the upgrade means there's less work left to do and the risk of unacceptable problems showing up is reduced. Although staying on version 1.8.5 is probably not too bad at the moment, it will become a big show stopper if we later figure out there's no way around upgrading. I think it's quite likely that we will be forced to upgrade sooner or later. If we base fundamental design decisions on v1.8.5, the work required for upgrading will increase the longer we wait. If we upgrade now, there's still the chance that SpiderMonkey will change in a way that requires big architecture changes. That's bad, but keeping track of what's happening there and maybe having a chance to influence it is still much better than continuing using v1.8.5 without having any idea of what's changing in future versions. That could help us avoiding some pitfalls. Unfortunately it's not as easy as quickly reading some changelogs with each SpiderMonkey release. I'm quite sure we wouldn't know about the changed relation between compartments and global objects if I didn't work on the upgrade. I've tried raising the SpiderMonkey developers' awareness about library embedders. It won't stop them making big changes if they think it's necessary for Firefox, but I hope they will try to make it as easy as possible for us to prepare for it. I really see some change there. For example they have started to provide supported standalone SpiderMonkey versions on a regular schedule. Also they expect the API to become more stable soon. I'm not completely convinced about this but I still thought it's the most acceptable solution to stick with SpiderMonkey and try to keep our version as close to the development version as possible (by upgrading SVN to ESR releases and keeping a dev-branch and syncing it about once every week). I partially agree here. I don't believe in promises of theoretical performance improvements anymore. On the other hand I expect the GC performance to be much more universal and less dependent on the scripts than JIT compiler performance. I think we currently have enough bigger problems than GC performance to work on. On the other hand we won't be able to completely avoid GC hiccups in the main thread with v1.8.5. Wraitii has some good points too IMO. For me the main argument is really avoiding to be stuck with an old and "frozen" version without preparing our engine for future changes. At the moment I'm trying to figure out if what we see on this graph is normal or not. I've reduced the number of GCs a bit because each GC call causes a more noticeable delay than with v1.8.5 (there are many flags to tweak GC though and I haven't tested them much yet). 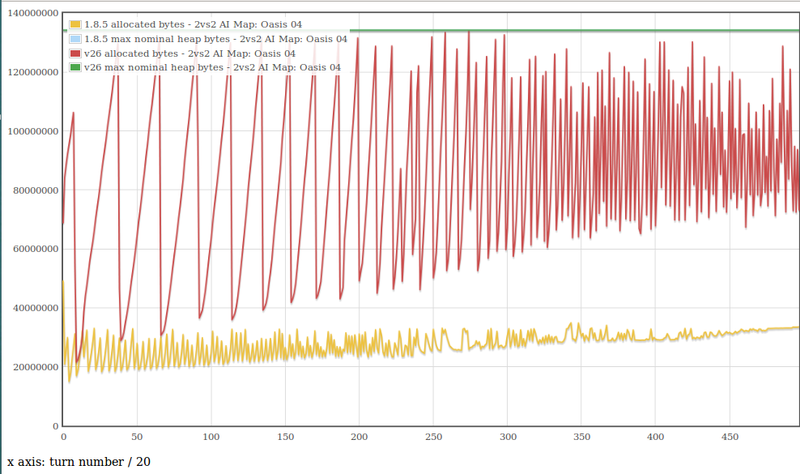 This graph compares JS memory usage of v1.8.5 and v26 during a 2vs2 AI game. V24 looks more or less like V26, so I didn't add that graph here. The used memory gets much higher because I've reduced the amount of GCs. More interesting than the peaks are the lowest parts of the graphs (after a garbage collection). I'd say that would be the amount of memory which is actually in use without counting memory that could be freed by a GC. It looks like V26 uses about twice as much memory as v1.8.5. It could be explained by the additional information stored by type inference and the JIT compiler. I don't know if such a big difference is normal for that. I've dumped the JS heap on turn 1500 and ran a few grep commands to compare where the additional data in memory is coming from. That seems absolutely huge, even for compiling. I'd post it over to the Spidermonkey forums. Maybe an issue with rooting. Yves, IMO, the game gets really irritating when there are lag pikes. So more frequent, but shorter GCs are more welcome than a few time-taking GCs. Even if the total time for GC is longer if you distribute it. But that aside, the memory usage after the spidermonkey upgrade is indeed strange. Maybe they changed pointers to 64 bit or something? we should run the GC every turn for testing purposes. If anything, this should be a separate branch on Git. Somewhere you can just try it easily at some point, to see how some changes react. I was thinking so the other day and it would be my preference, but until we've migrated to git, we can't really get everyone on board with that. Especially people who rely on the Windows autobuild, they're stuck on SVN. GC is something we really need to think more about, running it every turn may not be acceptable depending on what's going on, but it should be run regularly enough that it's not too slow. It seems likely that we need to be directly in control of when GC occurs since SM's metrics won't really take into account the impact on our engine. The thing with GC is that it should be faster per turn if we run it every frame, though it'd take more time overall. And what we need is FPS being smooth. I have only one question: Why you use js(SpiderMonkey)? I have this question because exist other language that more fast. For example - Dart. It was explained a bit earlier in this thread the decision was made several years ago so any change would involve a massive effort to change to an other. Yep, I understand. But possible if you make an effort to migrate to Dart then we get more profits. "P.S. I'm not sure that migration to Dart will require more effort than migration to *Monkey"
Using something that compiles to JS is completely backwards imo. You'll have to rewrite all code, and still have problems with the JS engine (s.a an ever changing API, jit bailouts, ...). I don't propose to compile to JS(use dart vm), but have to change a lot of code. However, Dart and JS very close by syntax I guess. Except that we will have to rewrite every line of JS ever written, it's very close to JS syntax. Just to know how are lag killing progress going ? I'm trying to drag my entire promo to 0AD, and that'll be nice if I could tell them about that, which we all know is the main problem here. If everything went fine this thread would'nt exist. I assume this question is related to the SpiderMonkey upgrade. 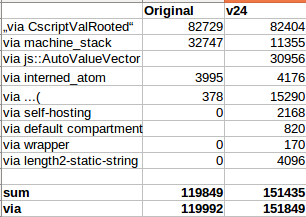 The current status is that the upgrade will make the performance a little bit worse for v24. Newer versions (I've tested v26) bring the performance closer to what we had with v1.8.5. and maybe beyond that at some point. The memory usage problem can be solved by correctly configuring the garbage collection. With the incremental GC it should also be possible to split up the time required for garbage collection more evenly and avoid big lag spikes. I have spent the whole day yesterday but I haven't yet completely figured out how GC needs to be configured. There are tons of flags to set and different functions to call and the documentation lacks.